The Good Place loves philosophy, and poking fun at it. As a rule, philosophers are not a funny bunch. Sure, Jacques Derrida delivered the occasional etymological pun and Daniel Dennett sometimes slyly trolls his readers, but erudite pranksters tend to be the exception rather than the rule. When they do manage something like humor, it almost always comes in the form of cruel barbs—directed, more often than not, at their own colleagues. It’s fitting then, that one of The Good Place’s best recurring jokes is that all philosophers wind up in the Bad Place. It would be too easy to dismiss this premise as the revenge of frustrated college grads, still raging over the lousy grades they pulled in sophomore courses with titles like “Mathematical Logic” or “Implicature and Pragmatic Theory.” On the contrary, this is a show steeped in the particulars of very real philosophical discourse. It just happens to be one that also sees philosophy itself as part of the problem. The Good Place’s commitment to critique—in, to put it pompously, the Kantian sense of investigating underlying conditions—has been in evidence since at least its first-season finale. In a flash of revelation, Kristen Bell’s Eleanor Shellstrop, who’s been living, so to speak, under the impression that she’s been mistakenly placed in heaven and has been terrified that she’ll be found out, realizes that she’s never been in the good place—and neither have any of those around her. To the contrary, the entire 12-episode arc that precedes her realization has been a protracted riff on John-Paul Sartre’s No Exit, a tale in which three troubled souls spend their afterlives tormented by their inability to see themselves except through others’ eyes. As Season 2 has picked up steam, the intellectual reference points have only grown more explicit. When Michael, Ted Danson’s demonic afterlife architect, realizes that he can’t keep rebooting his tormentees’ memories ad nauseam, he agrees to join them in the moral philosophy classes convened by William Jackson Harper’s Chidi, who in his predeceased state was a professor of philosophy. It’s a dubious gambit, not least of all because Chidi’s intellectual interests seem inextricable from his own central sin—a refusal to make decisions. This plot comes to a head in the season’s fifth installment, “The Trolley Problem.” That title refers to a thought experiment (first proposed, as Chidi explains, by the British ethicist Philippa Foot) in which a train conductor has to decide between staying the course and smashing through a group of five people or shifting to another track where the vehicle will run down a single soul. It’s a familiar quandary, not least because it has played a prominent role in popular culture. More often than not, the trolley problem is philosophy for those who can’t be bothered to study it—a way of getting your intellectual hands dirty without planting new seeds in the garden of mind. Michael’s enthusiasm for the dilemma is eventually revealed to be yet another trick, one designed to needle Chidi rather than to extrapolate on his premises. For all the geysers of gore, though, there’s also a deeper premise at play here: Philosophy itself, The Good Place suggests, may well be an impediment to right action rather than a path to it. 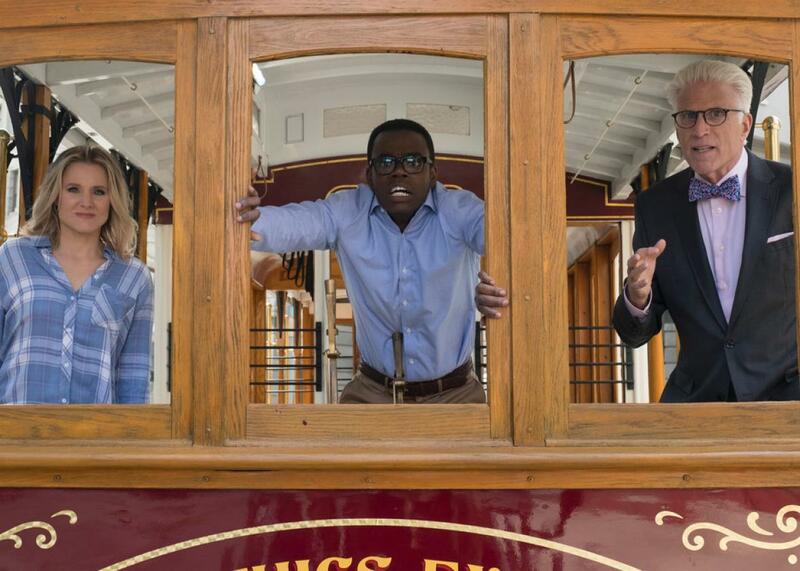 When Chidi proposes that the pleasure of the trolley problem derives from the absence of definite answers, Michael snaps back, “This is why everyone hates moral philosophers.” For all Eleanor’s frustrations with the demon, she can’t help but agree. Once we begin to problematize goodness, can we ever really be good? It is to The Good Place’s credit that it takes this question seriously, refusing to treat it in anti-intellectual terms. As the show’s writers seem to recognize, the way out of philosophy is through it, and they’ll likely to continue to build their stories around the difficult works of real thinkers. (The show’s production designers will also, presumably, continue to pepper other allusions into their sets: Shout-out to UCLA professor Pamela Hieronymi, recommended as “further reading” on Chidi’s blackboard.) None of the show’s characters, however, seem ready to think their way to heaven—and not just because Manny Jacinto’s Jason is among the stupidest characters in the history of television. If salvation comes for The Good Place’s characters, then, it will be in the way they treat one another. Like almost all comedic protagonists, they are frequently cruel, despite their budding connections. (Here, the show suggests a tantalizingly plausible premise: All sitcom characters, from those on The Honeymooners to the newly resurrected cast of Will and Grace, have been trapped in hell with one another, but only Eleanor and her confederates have had the ambiguously good fortune to realize it.) As our main characters have come to know one another better, however, they’ve begun to change, gradually sloughing off the characteristics that sent them to the underworld in the first place. That possibility begins to take clearer shape in the second season’s latest episode, “Janet and Michael.” On learning that he has to destroy Janet—a veritable personification of goodness—in order to save the particularly corner of hell he’s constructed, Michael hesitates. When she asks him why, he responds, “The reason is—friends.” Where hesitation is Chidi’s curse, it may well be Michael’s salvation, the happy side effect of his own “philosophical overdose” earlier in the season. One’s burden transforms into another’s blessing. Here the old Sartrean premise inverts itself: Only by reckoning with the ways others see us can we find our way to a better life. Here, we see the kernel of another kind of ethics, one with roots run from Baruch Spinoza’s investigations into causal relationships to Michel Foucault’s suggestion that queer love can disrupt “law, rule, [and] habit.” By The Good Place’s standards, both Spinoza and Foucault are, of course, in the bad place, but their work might yet show the way out. For Michael, as for those he set out to torment, hell is what we make for ourselves. And heaven? Heaven just might be other people.